Golden Coast understands the importance of finding — and — keeping the best people in roles right through the company, and it’s this ethos that has seen them grow through the years to become the UK’s leading independent supplier of wet leisure products to the trade. The Barnstaple-based company has presented numerous long-service awards over the last four decades, and the latest name to be added to the honour roll is lorry driver Keith Rossiter-Webb. Keith has been with Golden Coast for the past decade after being recommended by another of Golden Coast’s drivers, who was stationed with Keith in Germany when they were both in the forces. Since leaving the forces he has been very involved with Help for Heroes, spending a lot of his spare time fundraising, and even delivered a Tylo sauna and steam room to the HFH rehabilitation centre. A popular figure, particularly in the delivery and warehouse areas, Keith is known for his dry sense of humour and great one-liners. 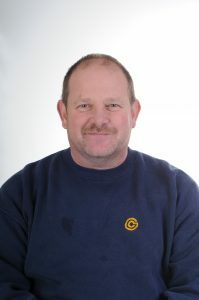 Golden Coast’s Managing Director, Jamie Adams said: “Keith’s been a great part of Golden Coast these past ten years. He’s a hard worker and does a lot to help people feel a real part of the team. His tireless work has seen him take Golden Coast products to all corners of the UK and halfway across Europe, and we look forward to working with him for years more.